Although just one flight became an international sensation, secret papers (now in the public domain - link) reveal that this was one of many such flights and this was the eleventh US spy plane that the USSR had shot down. This was the first time the Russians got 'bankable evidence' of the US incursions, because pilots had instructions to trigger a 'destruct device' to blow up secret parts of their plane and if by chance they survived they carried shellfish toxin, hidden in a coin, to ensure that they weren't captured alive. Thus the Americans routinely denied that these were spy planes engaged in identifying Soviet nuclear weapon sites for targeting by the US missiles but rather highflying weather research aircraft blown off course. As already announced on May 3, a United States National Aeronautical Space Agency unarmed weather research plane based at Adana, Turkey, and piloted by a civilian American has been missing since May 1. The name of the American civilian pilot is Francis Gary Powers, born on August 17, 1929, at Jenkins, Kentucky. United States Note to the U.S.S.R, May 5, 1960. This deceit was repeated by President Eisenhower directly to Soviet Chairman Nikita Khrushchev immediately before important diplomatic talks at the Paris 'Four Powers Summit'. The four powers were the previous allies against Germany: the US, Britain, France and the USSR. Khrushchev deliberately let the Americans think that like the earlier flights Powers had obeyed orders. So incriminating evidence on his plane must be securely destroyed and Powers must be dead. The American cover-up continued while the Russians disingenuously demanded to know more with headline catching suspicion. The problem was that the Russians had all the facts right from the start. Not only had the explosive evidence-destroying charges in his plane not been detonated but Powers was very much alive and telling all about the spy program. In addition to Powers the Russians had the high resolution cameras that were supposed to have been blown to smithereens, complete with incriminating photos of Russian military facilities deep inside the USSR. ...This and other information revealed in speeches of the head of the Soviet Government completely refuted the U.S. State Department's concocted and hurriedly fabricated version, released May 5 in the official announcement for the press, to the effect that the aircraft was allegedly carrying out meteorological observations in the upper strata of the atmosphere along the Turkish-Soviet border. After the complete absurdity of the aforementioned version had been shown and it had been incontrovertibly proven that the American aircraft intruded across the borders of the Soviet Union for aggressive reconnaissance purposes, a new announcement was made by the U.S. State Department on May 7 which contained the forced admission that the aircraft was sent into the Soviet Union for military reconnaissance and, by the very fact, it was admitted that the flight was pursuing aggressive purposes. Powers was paraded before the international press, along with the plane and it's damning evidence, before being convicted of spying and sentenced to 10 years in jail. The US press condemned Powers as a traitor for not destroying his plane and for allowing himself to be interrogated. I recall schoolboy discussions debating this in Australia. It has been speculated that Khrushchev had been looking for an excuse to sabotage the Four Powers Summit. Certainly all good will was lost and the Paris meeting collapsed. 1960 was a Presidential election year in the US. Richard Nixon the Vice President to Eisenhower was expected to win but the Democrat, Kennedy, campaigned heavily on closing the 'missile gap', alleging that the USSR had a big lead and that Eisenhower and by extension Nixon, was endangering the country by being too soft on defence. President Eisenhower, an ex-General and Supreme Commander in World War two had become concerned about the arms race and the power of the: 'military-industrial complex' (a term that he coined) and had reduced military size and weapons spending. The 'missile gap' (follow the link) was fictional - invented by the Kennedy campaign spin-doctors (and military donors?). After vehement White House denials the Russians had suddenly wheeled out Powers, together with the material evidence on the plane. Internationally the U-2 Incident was a major loss of face for the US and for the White House and therefore for Nixon. Kennedy was far more skilful (and presentable) than Nixon on the new medium of television and this was a gift from above. Seven months later, in November 1960, the American public very narrowly elected young, good looking John F Kennedy, with his beautiful wife, as President ahead of Nixon. In his inaugural address Kennedy promised to: "pay any price, bear any burden, meet any hardship, support any friend, oppose any foe, in order to assure the survival and success of liberty" and that call to arms was a promise he lived up to. In April 1961 the Cold War got a lot hotter when a CIA sponsored army of expatriate Cubans unsuccessfully attempted to retake Cuba at the Bay of Pigs. Follow this link to the relevant section from our 2012 trip to Cuba. The same year the US deployed PGM-19 Jupiter medium range nuclear ballistic missiles in Italy and Turkey targeted on Moscow and on military assets identified by the U-2 flights. The Russians responded by deploying their own missiles to Cuba. But before they could fully install them Kennedy threatened nuclear war if they were not removed. Both sides then backed down and the US removed their missiles too. The Kennedy administration kept this secret and pretended that at the end of the Cuban Missile Crisis the Russians had backed down unilaterally. This is a myth perpetuated even today. The failed Paris Four Powers Summit agenda had included the joint management of Berlin to limit the city's use by East Germans to leave their country. As a result of the collapse of the Paris Summit, and the Kennedy Administration's actions that year, on August 13 1961, Berlin was suddenly partitioned and the construction of the Berlin Wall began. Two thousand years ago, the proudest boast was civis romanus sum ["I am a Roman citizen"]. All free men, wherever they may live, are citizens of Berlin, and therefore, as a free man, I take pride in the words "Ich bin ein Berliner!" By year's end he was dead, assassinated, possibly because of US actions in Cuba. In his partial biography, Operation Overflight: A Memoir of the U-2 Incident, Powers is indignant at being branded a traitor. Interestingly he says he knows of several U-2 crashes and knew 'a number of' pilots who lost their lives. This must surely have seemed an extraordinary high crash rate given the small number of aircraft in service. He obviously doesn't know that ten of his colleagues were lost over Russia. He goes on to blame his failing marriage on the media assertions against him and the pressure of forthcoming hearing (which would exonerate him). He further claims that the 'so called facts' that he confessed to revealing under interrogation had been cleverly fabricated by him to mislead his Russian interrogators. As a result the CIA desperately wanted him back. And that's where New York lawyer James Donovan, played by Tom Hanks in Bridge of Spies, gets involved. Because he had defended Russian 'master spy' Rudolf Abel (played by Mark Rylance) who was doing 30 years in the US for his part in shipping Atomic secrets out of Los Alamos to Russia. The deal will be to swap talkative Powers for the recalcitrant, tight-lipped, Russian on the 'Bridge of Spies' (Glienicke Bridge) between West Berlin and Potsdam in East Germany. The movie spends a lot more time with Abel (not his real name) than with Powers. Donovan and Abel develop a real friendship despite Abel refusing to say anything in his own defence. "What good would it do?" he keeps asking. He too had been 'interrogated' before being given access to legal counsel but unlike Powers who was a simple pilot from Jenkins Kentucky, he was a trained professional spy, more or less immune to interrogation techniques. He would later become known as 'the spy who wouldn't crack'. Of collateral interest for me was that the movie spends some time in Berlin and some scenes, particularly those around the bridge, were shot there. Donovan turns out to be the hero of the story. Not only did he get Powers back but also a young American student, Frederic Pryor, who had been in the Soviet sector when the Berlin Wall went up and unadvisedly attempted to crash through the last gap (according to the movie) with his east German girlfriend. We get the impression that Donovan is more interested in freeing Pryor than Powers. The movie spends some time demonstrating that the CIA had no interest in getting a young American student out of jail and became alarmed that Donovan might fail to get Powers if he continued to demand two for one. As we later see, the trains continued to run between the sectors and rather than try to cross the Wall, Pryor would have been better advised to have trusted in his US passport at a station and simply caught the S-Bahn or the U-Bahn to the American sector. Like any historical movie many of us, particularly of my vintage, know the broad details before the movie begins and so the interest lies in the journey. For example, prior to the movie I was unaware of Pryor (OK, a dreadful pun). I have written about Berlin elsewhere (click here). So I found the journey that Bridge of Spies takes us on very interesting. But I couldn't help feeling that I was being preached to. Berlin was dark and blasted. New York's upper middle class suburbs were leafy. This is very true but somehow in this movie it seems to be a political statement. From his S-Bahn train Tom (as Donovan) sees a family of East Berliners shot-down attempting to cross The Wall. Out the windows of his New York commuter train he sees kids climbing a high fence and not a shot is fired. The New York train has obviously travelled beyond the South Bronx on its way out of town. But then, it would not be for a decade or so later that areas of the South Bronx would turn into a replica of bombed out Berlin and sightseers (fact finders), like NSW politicians visiting our New York office, would need an armed guard, 'Smithy' and special car, to take them there. Ok, I know that citizens of the West enjoyed a lot more freedom and were generally better off, despite areas of crippling poverty and disadvantage. After all, that's why people wanted to cross the border. But I don't believe in black and white, but rather in shades of grey, and I'm suspicious when someone is trying to sell me some 'ism' without admitting that it too has its seedy underbelly. But to be fair the movie is not all 'them bad, we good'. When Donovan is defending Abel his house is dramatically shot-up, bullets narrowly missing his children and wife. I can't imagine the good people of Westchester doing such a thing. Probably the KKK from 'down south'? Obviously when telling a story in a couple of hours a lot of the complexities need to be skipped over but I found that there were some confusing elements. Just what was the stuff about the East Berliners and the Russians? Well it's not all that confusing. After the German surrender the allies, the four powers, jointly occupied Berlin. Berlin is deeply embedded in what was then the DDR (Deutsche Democratic Republic - also GDR), a Communist State and part of the Eastern Block. Berlin was divided into four sectors: US; British; French and Soviet. Under this four powers treaty the three other powers only recognised the Russians. But from a DDR point of view the city was a capitalist cell in the middle of their country. They tried a number of ploys to remove it, including a siege, but the Western powers famously kept West Berlin alive with a huge airlift. Berlin had become a virtual puncture in the fabric of the DDR through which citizens, many of them high value professionals, could desert the East for the West. When negotiations to stem this flow broke down they built the Wall. In the meantime the DDR had no legal standing in Berlin. This was a bit disingenuous as Germans in the Western Sector had been given local government. But somehow Germans in the East were an illegal DDR presence and unrecognised. That's what the Eastern guys in the movie, at times sinister and at others comic, are complaining about and struggling against. Before the end credits we get a quick synopsis of subsequent events in the lives of the major participants. We learn that James Donovan went on to negotiate the release of 1,113 prisoners with Fidel Castro after the Bay of Pigs fiasco. Confirming his reputation for getting 'a bit more', he simultaneously negotiated safe-passage for around 8,500 Cubans wanting to leave the country and the release of a number of CIA 'advisors' to the failed invasion. He too died young, of heart failure in 1970, a month short of his 54th birthday. Although sacked as a test pilot after the release of his self-serving book Powers was eventually raised to hero status and showered in medals and accolades. These included the: Prisoner of War Medal; the Distinguished Flying Cross; the National Defense Service Medal; the CIA's Director's Medal for extreme fidelity and extraordinary courage in the line of duty; and the Silver Star. Unfortunately for Powers' mental health, self-esteem and marriage these were all awarded posthumously, after this unreliable man was safely dead in a helicopter crash at the age of 47. The crash was said to be due to pilot error but above all he was an exceptional pilot so maybe depression played a part? Like so many others not recognised until after their death, he never got to know of his redemption or new exalted status. Despite the strong impression given in the movie that Abel is going to some unpleasant outcome he received a hero's welcome. His face even appears on a Russian stamp as Rudolf Abel. He was reunited with his family and became popular as a lecturer on espionage before contracting lung cancer and dying at 68 years of age. When he returned to Russia he was awarded with the Order of the Red Banner. The US promptly awarded Powers with the CIA's Intelligence Star, the only medal he received during his lifetime. No movie is perfect, particularly when it has to tell a true story in an interesting way but this one is well worth seeing. After all, it is Spielberg and the Cohen Brothers. 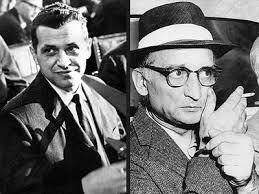 But for Gary Powers Kennedy would undoubtedly have lost the extremely close 1960 Presidential Election to Nixon. Then JFK and his brother would not have been assassinated. What about Martin Luther King Jnr? In particular it's unlikely that the Vietnam War would have escalated. After the Berlin Wall; the Bay of Pigs; and the Cuban Missile Crisis; Kennedy was said to be determined to 'draw a line in the sand' - for freedom. The Eisenhower/Nixon White House is reported to have been more interested in Laos. After the disasters of 1961 Kennedy is reported as telling the New York Times: "Now we have a problem making our power credible and Vietnam looks like the place." This choice had the added benefit helping out President Ngô Đình Diệm, the Vatican endorsed: 'Saviour of Vietnam', a fellow Roman Catholic who'd pleaded for US (and Australian) help to prevent the country falling to the Communists. Since the defeat of the French in Vietnam there had been US military advisers supporting the fragile government of South Vietnam that had been 'elected to power' by violently suppressing the opposition. The governing Cần Lao Party thereafter claimed to be democratically elected but to be unable to hold further elections due to a state of martial law. The leaders were a Roman Catholic elite in a country that was predominantly Buddhist. Eventually even Kennedy would grow sick of the excesses of the poisonous Diệm Regime; temporally terminate diplomatic relations; and agree to a CIA supported coup in which two of the Diệm brothers were murdered. See Vietnam on this website - scroll down and read more below the image of Notre Dame Cathedral Saigon. Nevertheless, by the time of Kennedy's own assassination there were over 15,000 US 'advisors' and around a hundred Australian 'advisors' and support people in Vietnam. His successor President Johnson (LBJ) would drop the pretence that these were non-combatants and increase the number to 550,000; Australian personnel would rise to a peak of 7,672. This commitment would only begin to decline after Nixon, eventually, won the 1968 Presidential election. So who was Rudolf Abel? Well, as I have already told you not actually Rudolf Abel at all. In the movie he is played by Mark Rylance is best known as Thomas Cromwell in the television series Wolf Hall who is the correct age for the part. Appropriately, Mark Rylance is a stage name. He was born David Waters. The spy had been tried and convicted in the US as Rudolf Abel. This was a name he selected from fellow KGB Colonels back home in order to send a message to the Russians that he had been caught and hadn't talked, even to the extent of revealing his true name. The man the FBI caught was known to the Russian defector who 'shopped him' as MARK so the FBI accepted the offered pseudonym and it stuck. He was Vilyam "Willie" Genrikhovich Fisher, a KGB Colonel with distinguished military service during the Second World War when the Russians had been our allies. To understand Willie better you need to know a little bit of Russian history. I suppose that everyone knows that Lenin was the leader of the Bolshevik revolution that sized power in October after Tsar Nicholas II had been forced to abdicate during an earlier revolution in February 1917. Willie was 'Bolshevik aristocracy'. He was the son of a leading Bolshevik and revolutionary and a close colleague of Lenin's in their struggle. His mother too was committed to the cause. Thus Willie was exceptionally loyal to their cause and to socialist Russia. The family were German speaking Russians. Prior to exile in England Willie's father was had been an engineering professor in St Petersburg. Ethnic Germans were over-represented in the professional class in Russia. Many had been in Russia for generations, encouraged by tax and other privileges to settle there by Russia's largely German aristocracy; particularly Peter the Great and Catherine the Great. But by the start of the 20th century German speaking Russians had fallen out of favour. As tensions with the new united Germany and domestic unrest in Russia increased their loyalty had become suspect. The thin edge of the wedge was inserted at the end of the previous century when the reforming Tsar, Alexander II, had removed the tax and other privileges enjoyed by ethnic Germans (like himself) and, committed to the unifying affect of Orthodox Christianity, put the Protestants among them under pressure to emigrate. Many left for the 'new world'. The professional middle classes were extremely unhappy and as unrest grew attempts on the Tsar's life became commonplace. Two previous Tsars had already been put away. After several failed attempts Alexander was successfully assassinated in a coordinated multiple bomb attack in St Petersburg (see my travel note and the Church of Spilled Blood). He was succeeded in 1881 by Alexander III. Alexander III was a religious conservative who disliked his father's relative liberalism. He began the active oppression of ethnic and religious minorities; particularly Jews and non-Russian speakers. Lenin's brother, Aleksandr Ilyich Ulyanov (Sacha), attempted to assassinate him; a crime for which Sacha was executed. This is said to have caused Vladimir Ilyich Ulyanov, who took the name Lenin, to become a revolutionary in turn. Alexander III died of natural causes in 1894 to be succeeded by 'Bloody' Tsar Nicholas II, a religious zealot, believing in miracles and the divine right of kings, in addition to the quackery of Rasputin. He was a military incompetent, interfering disastrously in a war with Japan and then in the First World War. He also instigated bloody, religiously motivated, pogroms against the Jews. His infamous secret police rounded up ethnic Germans and other minorities and exiled them to Siberia without any legal cause. His secret police are also suspected of concocting the The Protocols of the Elders of Zion, a book that would help to fuel anti-Semitism in Germany, Britain and the United States between the wars. He was the essentially ignorant and misguided man who precipitated the Revolution and set the scene for the Nazis twenty years later. He, together with his family, met a particularly unfortunate end. There's more information about the Tsars on this website - follow this link. All these things served to radicalise the professional classes. Like Lenin, also from a professional family, Willie's parents became revolutionaries dedicated to Marxism and the overthrow of Imperial Russia. From my point of view there is another interesting thing about Willie. He was born William August Fisher 14 years earlier than my father, a few miles from my birthplace in Newcastle upon Tyne. When exiled from Tsarist Russia his father had chosen Newcastle as a good place to buy guns then to ship them to fellow revolutionaries in the Baltic. Young William was technically literate from an early age and a radio amateur. After school he worked as an apprentice draftsman at Swan Hunter & Wigham Richardson Ltd, the Shipyard where my grandfather was Assistant Shipyard Manager. Not only that, but my grandfather's close friend Bill Buckle, who introduced him to my grandmother, rose to become chief draftsman and was in all probability William's supervisor. Follow this link. Young Fischer was fluent in several languages including English, Russian and German and when the family returned to Russia he worked as a translator and then in radio: first as an operator and then in radio research, before being recruited to train spies. In this role he was part of elaborate wartime spy games to disrupt the Germans and capture their agents. The first atomic bombs were dropped on Japan in 1945. A year later Willie would became a professional spy presumably hoping to protect his country from a similar fate. Willie is known to have entered the United States as Andrew Kayotis in November 1948. During the next eight and a half years he travelled around North America under a variety of pseudonyms. In New York he used the cover of being a painter and photographer, to explain his range of equipment, and was relatively active in the New York art scene, inviting other artists to his studio. He was or became a competent painter, if too figurative for the fashion of the day, as we see in the movie. He even got to return to Russia to see his family and had just got back, to discover his fellow spy's treachery, before being uncovered himself. By the time he was eventually discovered and arrested in New York (in April 1957) he was 53 years old. Partly based on stolen information the Soviet Union would successfully explode its first atomic (fission) bomb in 1949. Then in 1952 the US would explode the first hydrogen (fusion) bomb. Russia would soon respond with its own version, topping this in 1961 with the most powerful hydrogen bomb that has ever been exploded. Meanwhile Britain and then France (independently) would demonstrate their nuclear capability followed by: China; India; Pakistan; and North Korea. Historically Russian scientists and engineers have been at the forefront of many technologies (see my comments on Radar elsewhere). For example, Igor Sikorsky (of helicopter and flying-boat fame) was one of several Russian aviation pioneers. This tradition was set back for a period when that 'ignorant peasant', as Churchill called him, Joseph Stalin decided it would be a good idea to 'purge' his scientists. But the 'bomb' saw them reinstated. So as the fifties rolled on the obvious lead Russian scientists and engineers had taken in some areas of space, aeronautics and submarines would lead the US to steal Soviet secrets. Spying on each other to discover technical advances would quickly become a major pastime for many nations. More recently modern 'stealth' technology (that makes ships and aircraft invisible to Radar) is based on the work of the Russian/Soviet physicist Petr Ufimtsev. But 'stealth' technology did not have to be 'stolen'. Like so many other significant breakthroughs it was not thought to be important enough to be kept secret and was simply translated by US aircraft makers and French ship builders from a book in Russian: Method of Edge Waves in the Physical Theory of Diffraction, that was in the public domain. Professor Ufimtsev worked in the Institute of Radio Engineering and Electronics of the USSR Academy of Sciences, the same institution as Willie had. But it's a sign of the times that in the 1990's Professor Ufimtsev was a visiting lecturer at UCLA in California. No, he hadn't defected, he was on loan from the University of Moscow. At the end of the day it was not clear what or how much secret information Willie or his network had stolen or possibly simply taken from public sources. His movements are largely unaccounted for and such information that was intercepted was one time code and indecipherable. Most of what is known about his operations was revealed by a defector who was an incompetent, a drunkard and a thief, who Willie had little reason to trust and had already asked to be repatriated. Initially the defector even had difficulty providing enough information to identify 'Rudolf Abel'. If the Russians hadn't successfully stolen US atomic secrets who knows what might have happened? Maybe the USSR or China or Vietnam would have been 'nuked' like Japan? Although the secrets obviously leaked, US authorities dismiss Fischer/Abel's role in this; while the Russians claim the opposite. Take your pick: Lies, damn lies; and propaganda. Had John Fitzgerald Kennedy not won the 1960 US Presidential election then the 1960's would not have been as we remember them. If there had been no escalation of the Vietnam War: 'to make US power seem credible', then there would have been no conscription in Australia; no American or Australian 'Draft Dodgers'; no calls to 'give peace a chance'; no protest folksingers. No 'swinging sixties'? No hippies? On the other hand it's probable that racial tensions in the United States would have been handled less sympathetically and it was Kennedy who founded the Peace Corps. Kennedy's nuclear standoff with the Russians evolved into the MAD (mutual assured destruction) doctrine. Soon sufficient weapons of mass destruction were, and still are, held by both the US and Russia to assure the complete annihilation of both the attacker and the defender should it ever come to nuclear war. Kennedy's 'robust' confrontation with the Russians continued under Johnson and eventually a nuclear test ban treaty was signed. Successive administrations have been more conciliatory. President Regan proposed talks leading to START I (Strategic Arms Reduction Treaty) signed by President Bush (Senior) and President Obama more recently signed New START with the Russian Federation. Meanwhile Marxist economics failed in every country that tried it and the world (including the those countries that are still nominally Communist) has largely returned to a market based economic model. Nevertheless US confrontation with Russia (and vice versa) has become a habit and the MAD doctrine still hangs over the World like the Sword of Damocles. Kennedy's other competition with the Russians was the 'Space Race'. Kennedy was famously opposed to the rather ragged US space program until April 12, 1961, when Soviet cosmonaut Yuri Gagarin became 'the first man in space'. The evident Russian lead in rocketry obviously had defence implications. It meant that the Russians could potentially deliver a nuclear bomb to any point on earth. It was Kennedy's epiphany. With this flash of Russian light in the sky he became a convert to space technology. The impact of this program on the future is difficult to overstate. It gave us the technology of the 21century: everything from silicone chips to non-stick frypans. The ability to cheaply travel the world and to communicate electronically even faster rely on technologies developed for that programme. A myriad of spin-off technologies flowed from the Space Program, like all those that depend on small powerful computing devices; as well as new understandings and abilities in medicine and genetics. But more than all these changes in the fabric of time, the sixties was when those of my generation met and wed (or not) and bred. We met at sixties parties and produced a generation of children who would not be here if the times had been different. Perhaps their siblings would be here but many pairings simply wouldn't have happened at all. Those children are now producing children of their own. So we now have a world of people who simply wouldn't have been had Francis Gary Powers done as he was told. New South Wales electricity users are to suffer another round of hefty price increases; with more to come. The Independent Pricing and Regulatory Tribunal (IPART) has announced that electricity prices for the average New South Wales resident will increase by 17.6 per cent from July. Sydney customers will pay on average about $230 more each year, while rural customers will face an extra $316 in charges. IPART says it is recommending the increases because of costs associated with energy firms complying with the federal government's Renewable Energy Target (RET). The RET requires energy firms to source power from renewable sources such as solar or wind. What is this about and how does it relate to the planned carbon tax? If you want to know more read here and here.